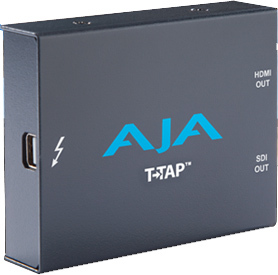 Professional outputs - T-TAP features HD/SD SDI and HDMI outputs. The SDI output can be used to feed professional monitors or recording gear, while the HDMI output is able to feed directly into consumer HDMI monitors. Both HDMI and SDI are active at all times, so you can simultaneously work with professional and consumer gear.